Say hello to the Indigo Bowl, a colourful bowl filled with bold flavours and packed with nutrients. Starting this week we’ll be sharing one Indigo Bowl a week to give you some meal inspiration. “But what can I eat when I eat vegan?” or “Isn’t it hard being/eating vegan?” are some of the question I get asked frequently, this is why I created these bowls as an answer to these questions, showing the abundance you can have when choosing to eat vegan. I’d also like to show that these recipes don’t have to be extremely difficult or filled with expensive and elusive super foods. Of course we have to start of with one of our signatures, a unicorn noodle bowl. We combined the cold noodles with a warm stir fry and some sweet and spicy sesame tofu (recipe here). The recipe for the sir fry can be found at the end of this post. 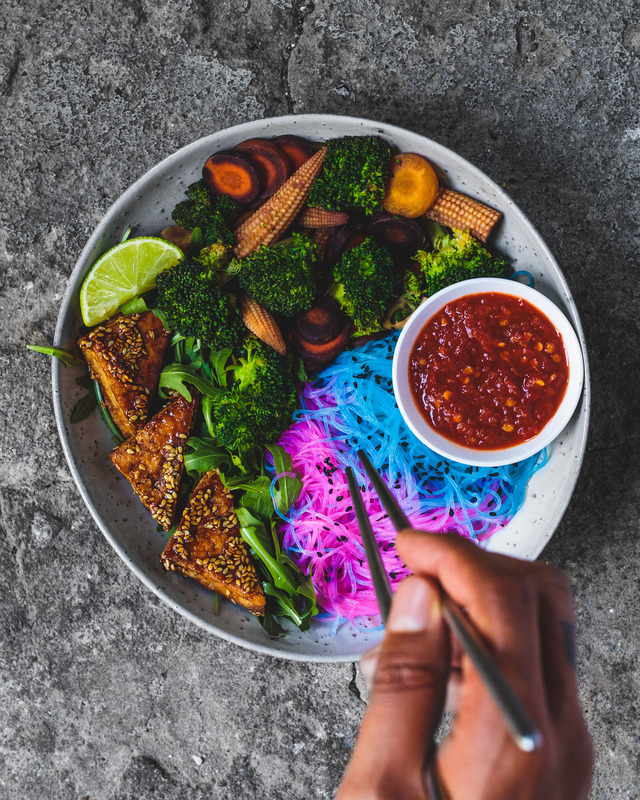 To learn how to create these vibrant and naturally coloured magical noodles go over to this post. 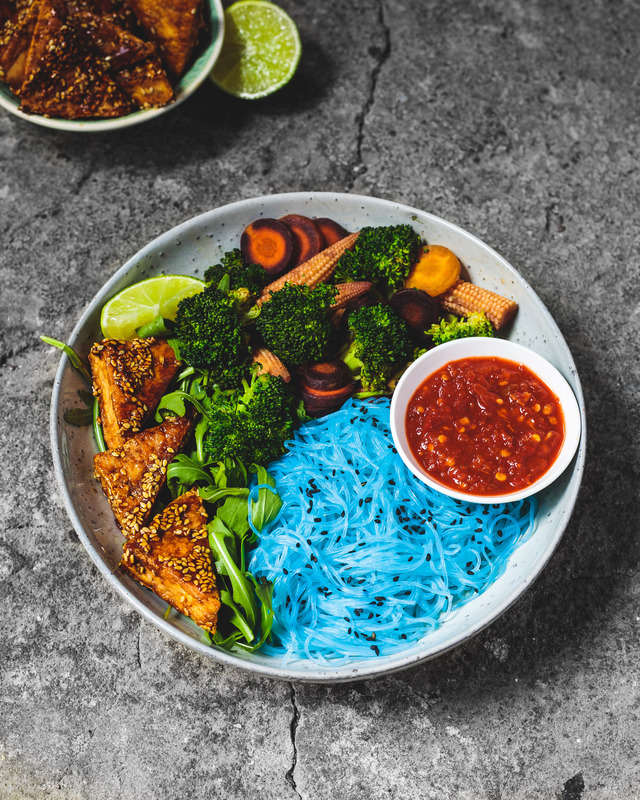 This bowl is packed with protein from the tofu and broccoli so this doesn’t only make a great meal, it’s also a great post workout bowl focussing on whole plant foods with a spicy sauce, making sure we’ll fuel our bodies with nothing but the good stuff! You can use any hot or chili sauce you’d like or maybe try this satay sauce to add over your veggies. If you end up making this Indigo Bowl, don’t forget to tag me on Instagram and use #indigobowl so I can see your creation. A vibrant and colourful bowl packed with flavour and healthy nutrients. Add some oil to a pan and add the garlic, cook this on medium/low for about a minute before adding the vegetables. Cook this for about 5 minutes on medium/high while stirring. Now add the soy sauce, coconut sugar & spices and cook for another minute. 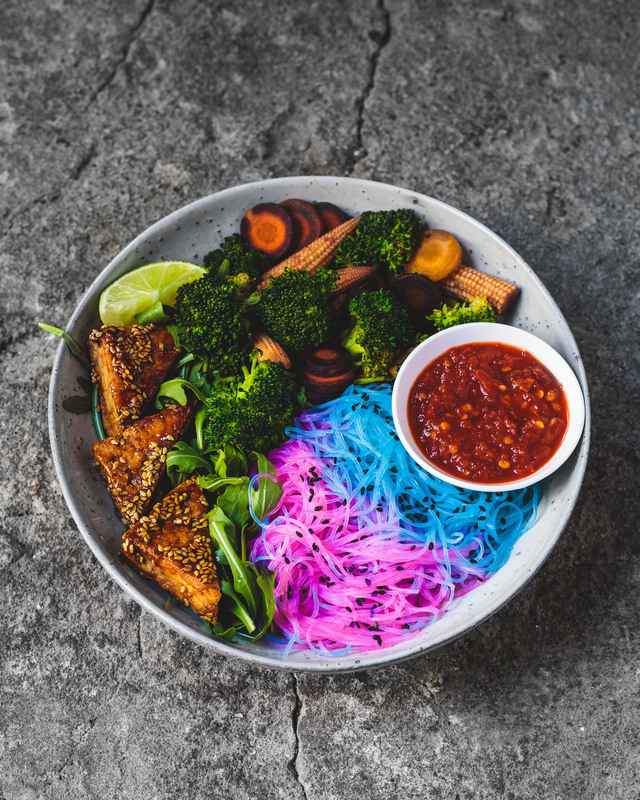 Add the Unicorn Noodles, Sesame & Garlic Tofu and Veggies to a bowl and serve with some Arugula, Lime, Satay Sauce (or hot sauce) and optionally some toasted sesame seeds. Enjoy!